CHRISTCHURCH, New Zealand, June 13, 2011 (ENS) – Another series of earthquakes today hit New Zealand’s South Island city of Christchurch, which is in the midst of recovery from a devastating quake that struck in February. The quakes damaged more buildings and shook up the already-traumatized residents. At 2:20 this afternoon, local time, a 6.0 magnitude quake rocked the city from an epicenter just 13 kilometers (eight miles) to the north-northeast. It was the largest in a series of temblors that began at 1 pm and lasted until just after 3pm. 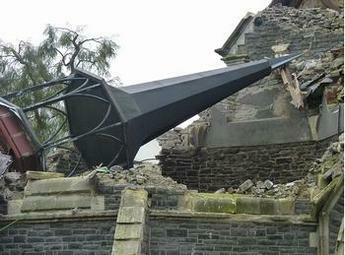 The large quake was felt as far away as Wellington and Invercargill, and further aftershocks are expected. Flights are again taking off and landing from Christchurch after the airport was briefly evacuated Monday, but travelers are warned to expect delays. No airport buildings were damaged, the New Zealand Fire Service said. In the Central Business District, the Fire Service rescued two people who were trapped in St. John’s Anglican Church in Latimer Square, already damaged in a major earthquake last September. Christchurch Police headquarters was evacuated, and so were the offices of the Canterbury Earthquake Recovery Authority, the center of operations for recovery from the February disaster. Canterbury Police District Commander Superintendent Dave Cliff confirmed there were no casualties in this afternoon’s quakes. Two people are in Christchurch Hospital with serious injuries, while 44 others were treated and discharged, said a spokesperson for the Canterbury District Health Board. 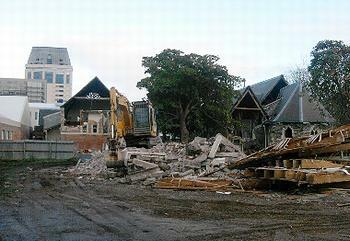 More buildings in the Christchurch central business district have been damaged, with some collapsing, including some empty buildings scheduled for demolition in the Red Zone cordoned off after the February quake. The Canterbury Earthquake Recovery Authority reports extensive damage in the eastern suburbs and on the hills suburbs of Sumner and Redcliffs. Police are asking residents to stay off the roads if possible. Four road and rail bridges are closed and at least five others are closed while awaiting inspection. At a news conference late this afternoon, Mayor Bob Parker said some roads are blocked with liquefaction, flooding, rockfall, and retaining wall failures on the hill roads. The mayor said that in the Clifton Terrace area 27 houses are being evacuated because they stand on an area where land moved in the earlier quake. The road into the area is closed. He said water pipes across the city have burst and water pressure across the city is very low. The mayor and Civil Defence officials encouraged residents to boil their water before drinking. Thousands of Christchurch residents are spending a chilly night without power or water. Immediately after the earthquake 56,000 residents and businesses were without power, said officials with Orion, the electric utility, but officials said they expect their crews can reduce that number to 20,000 overnight. Rocks have come down on some power lines, but overall no serious damage was inflicted on the electric network, officials said. “Crews expect to achieve more strong progress with power restoration as day breaks tomorrow,” the company said in a statement. A welfare centre has been set up at Cowles Stadium, which can house up to 300 people. Schools and several supermarkets will be closed on Tuesday. Some of the city’s landmark buildings will have to be demolished. Canterbury Earthquake Recovery Authority said on Monday just before this latest round of quakes that the 17-story Clarendon Tower must come down because it poses a threat to many surrounding buildings. On February 22, the day of the devastating quake, dozens of tenants were trapped in Clarendon Tower for hours after inside stairways collapsed. A 5.5 magnitude aftershock on June 6 caused further damage. Mayor Parker acknowledged that the latest quakes may prompt more Christchurch residents to join those who have moved to other cities in New Zealand and Australia. The Canterbury area has been hit by strong earthquakes since September 4, 2010 when a magnitude 7.0 quake occurred, followed by the 6.3 quake on February 22 which killed 181 people and caused massive damage in central Christchurch.